Coalwood had one (and only one) mine shaft. The shaft was used to take men down to the mine and bring them back up. 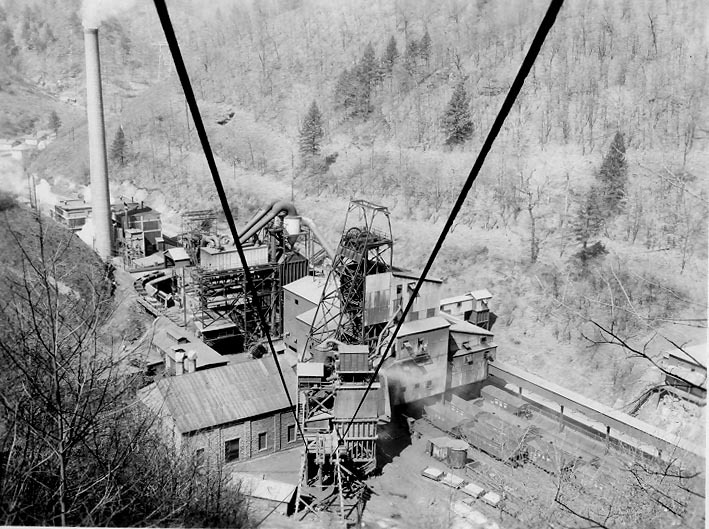 The same shaft was used to bring small railroad cars of coal up to the surface. There were several other ventilation shafts in this general area which were used to vent gases from the mine. 11. (Not shown in the picture.) Directly behind where the photographer was standing was a huge slate dump. This was used to dump rock and waste that was sorted out in the tipple. This slate dump was reclaimed in the 1980s. David was told that the coal recovered was as high as 60 percent. If you walk up the holler between the Water Company and the old shop, you can still see remains of the dump. dump it in the huge slate dump (#11). 13. 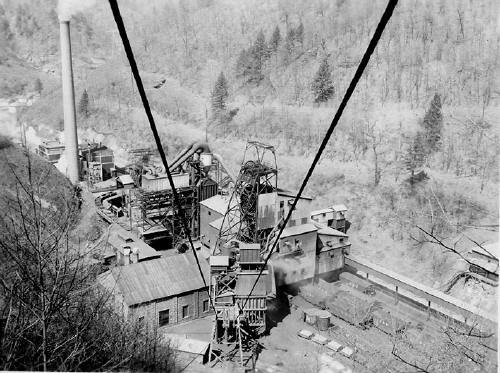 David Goad has been told that this is a conveyor belt taking certain grades of coal to the upper part of the yard to be loaded on coal cars. 14. These are empty railroad cars to be loaded with coal. The empties were pushed to Six (to the right side of the picture), then dropped to the tipple and loaded. The engine didn't pull the loads; they were gravity fed down the track just like Caretta. 16. This is a pedestrian bridge over WV 16 leading to the tipple and mine shaft. 17. This is the first house across the road from the tipple. There were several houses in this little area. 19. This is the main hoist house and lamp house. The hoist operator was inside this area. The lights for the miners were in here also. 20-21. This is where the slate was loaded into the tram bucket. 22. Mine shaft and hoist equipment. 23. Mine office and blacksmith shop. 24. David writes: "This is just another part of the tipple. This may be the area where the picking tables were. Not real sure. The only person I know who may know for sure what the things were at the tipple is Red Carroll. He worked there till they tore it down. Next time I go to Coalwood, I will ask him." 26. Smokestack for the power plant.